I remember the good old days where I was capable of filtering people into two categories: people I could potentially become friends with and people I never will never give a chance because they liked bands like Fall Out Boy. That fad of bands eventually faded away and I had to resort to watching out for other qualities I didn't like in people like hipster bowl-cuts, Black Eyed Peas ringtones and Affliction t-shirts. Luckily for me and my cynical ways, Fall Out Boy is sort of coming back and I'll be able to start that hate parade all over again. 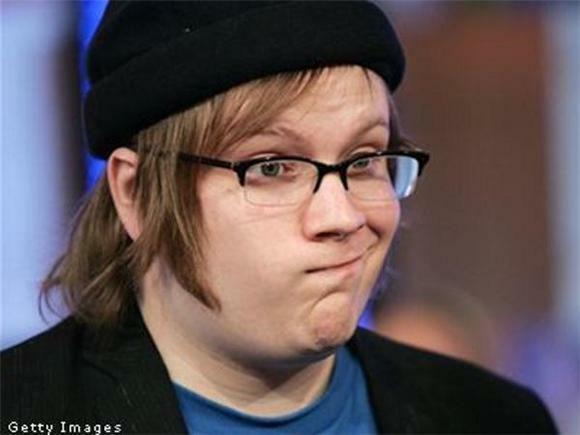 That's right people, Patrick Stump from Fall Out Boy is venturing out on a solo mission of a career and commencing it with two versions of the same song! OMG! He's keeping it hip though and releasing it as a 7", side A being "Spotlight (New Regrets)" and Side B being "Spotlight (Oh Nostalgia)." New Regrets sounds like something that plays in the Footlocker at a mall near you or a frat party. Oh Nostalgia on the other hand is an attempted soulful jam that is guaranteed to be a staple in any forthcoming Eat Pray Love kind of movie. He kind of looks like Rivers Cumo in that picture. I hope Rivers doesn't pose like that too often though.